How absurd can you get ? The Magna Carta Trust backed by Runnymede Borough Council are planning to commemorate the 800th anniversary of the signing of the world famous "Great Charter of the Liberties of England and of the Liberties of the Forest" in 1215 by King John in which he agreed to obey the law and not ride roughshod over the rights of ordinary men and women - by disobeying the law and riding roughshod over the rights of ordinary men and women living in the area. Including local riders. The Trust want to build not only a £3.5 million visitor centre but also a giant memorial on the common. Runnymede Common, however, is still subject to the Egham Inclosure Act 1814, which places a statutory duty on the owner to keep it unfenced, unbuilt on, and open to ordinary men and women. Not only that. It is also a registered common under the Commons Registration Act 1965 and is subject to the Law of Property Act 1925 as an urban common which grants the right to air and exercise to pedestrians and equestrians over all of the land. Building a visitor centre will also inevitably mean stopping walkers as well as riders from having access to the whole of the common. Which is again against the law. Local residents, walkers and riders are beginning to take up arms against the plans and, like the barons in their battle against King John, fight to protect their rights. Says local resident Andrew Telford, who is Chairman of the local Runnymede branch of the Campaign for the Protection of Rural England and who has lived in the area since 1970, "Nothing but nothing may be built on the common. There cannot even be car parks on the land and it cannot be driven on without lawful authority. "Any development, such as a memorial, in itself, might be a small step. But small steps insidiously become big steps and before we know it the character of the Common will have changed. If this Common is to survive as a place for quiet recreation and contemplation, and if development on it is not to further urbanise and fragment this vulnerable narrow band of Green Belt, nothing should be built on this land by the Magna Carta Trust or anyone else." "Runnymede Borough Council is, apparently, looking to the commercial gain that might be made rather than the protection of the common. They want to build a visitor centre, they say, to attract 250,000 extra visitors a year to this already traffic clogged rural setting. Their whole drive seems to be to attract tourists in the hope that they will spend money in the local area. This was discussed with undisguised enthusiasm at the Council's recent Corporate Management Committee meeting. When one Member raised concerns that it would affect the character of the land and abstained on the resolution, he was booed by his colleagues." Says Bob Milton, one of the leading experts on equestrian rights of way and common land in this country, The National Trust, which owns Runnymede Common, has already interfered with the rights of the public for lawful air and exercise by fencing off most of the common only allowing access on public footpaths and intends to increase the amount of enclosure and fencing on the common. "The National Trust has gone out of its way over the last 20-years to misinform the general public as to their rights of access and to develop the common. 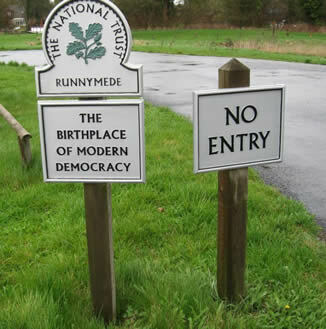 The National Trust Acts give it the duty to hold common land for the benefit of the public yet Runnymede is yet another example of their disregard of public rights. The Trust owns adjacent land which is not subject to public rights, let them use that." The only way the Magna Carta Trust could build on Runnymede Common lawfully would be if the Secretary of State for Defra overturned all the legislation governing the common and gave permission for plans to go-ahead. "What's more," says Andrew Telford, "Englefield Green was rated as the second most socially deprived village in Surrey in the most recent census figures available. It is the worst Ward for crime in Runnymede Borough and there are serious poverty issues. We should not be spending our money on a visitor centre or a memorial." Do you think Runnymede Borough Council are riding rough-shod over our rights? Please e-mail and tell us. Runnymede Borough Council has just published an invitation to complete a survey form relating to a visitor centre to be built at Runnymede in time for the 800th anniversary of the making of the Magna Carta in 2015. The survey is at this link. You might like to complete it after you have read the following. Unfortunately, our Councillors are looking to the commercial gain that might be made rather than the protection of the common. They want to build a visitor centre to attract 250,000 extra visitors a year to this already traffic clogged rural setting. Their whole drive seems to be to attract huge numbers of tourists in the hope that they will spend money in the local area. This was discussed with undisguised enthusiasm at the Council’s Corporate Management Committee meeting of 26th May 2011 – Cllr Geoff Woodger who, to his great credit, raised concerns that it would affect the character of the land and abstained on the resolution, was booed by his colleagues - led by John Furey. John Furey is the ex Leader of our Council and the man who voted against an underpass at Vicarage Road level crossing, at a recent Runnymede Local Committee meeting, having spoken at length about his concerns regarding Surrey Highways' Airtrack evidence that this would increase traffic in the already highly congested Egham Area, and in particular at the Runnymede Hotel roundabout right next to the common. Regarding the visitor centre at Runnymede, favourable comparisons were made by our Councillors with the new 'Visitor Centre' at Savill Garden. This speaks volumes, because, whilst this building may have architectural merit, as those of us who visit Savill Garden know, it is little more than a retail outlet, with a cafe and a large shop, selling a range of items completely unconnected with Savill garden, including, on at least one occasion, plastic dinosaurs. This attracts huge numbers of visitors, by car and coach, making the narrow Wick Lane all but impassable to locals, and damaging the roadside verge. If this vistor centre at Runnymede, with any associated car parks, is built on the common, it will restrict public access on foot and horseback and urbanise and change the character of this open area for ever. For some more information on all this, see the attached letter to Alice Richmond, one of the Magna Carta Trustees and the treasurer of the American Bar Association. It's not clear who will pay the £3.5million for this visitor centre, or even the feasibility study at £50k. Runnymede Council doesn't have the funds for this, so they are approaching Proctor and Gamble, Crest-Nicholson, and other local companies to come up with the money. It remains to be seen whether these local companies will pay for a feasibility study into, or fund the building of, something that might be unlawful. The National Trust, who own most of this land, the Campaign for the Protection of Rural England, the British Horse Society, members of the Open Spaces Society, and many local residents are of the view that nothing should be built on the common, and nothing that attracts more vehicles should be done. If you think so too, you might like to fill in the survey saying so, and forward this email to those you know who might agree. If you would like even more information on the legal protection this highly protected land enjoys, see this link.